Hey y'all! Who else was glued to IG this past weekend? I sure was! Some pictures I could have stared at for hours just soaking it all in. Hopefully, one day, I will get a chance to see all of this in person! Also, I so excited that it's that time again over at Amy's Creative Side....Yup! Blogger's Quilt Festival! I am also super excited to share what I plan on entering into the Applique Quilt Category! I am also sharing a little bit of big relish's new room, so if you love Cotton + Steel, please keep reading! Since we moved in the new house, back in July, I knew I wanted to make big relish a special wall hanging for her bedroom. If you ask her what her favorite animal is, she will tell you horse and then go on to tell you that her favorite bug is a butterfly. 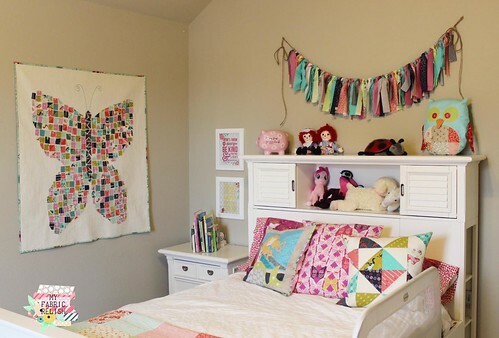 It was so easy picking out fabrics this past spring and summer for her room because horses and butterflies were everywhere! 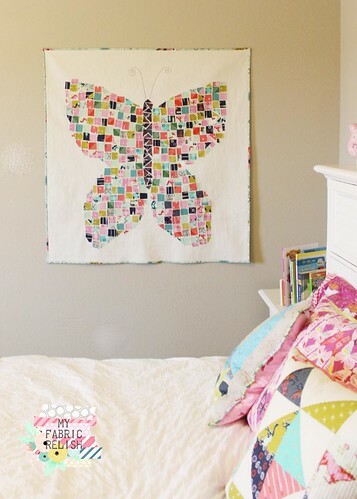 After hours of Pinterest-ing and Google-ing "butterfly" I just couldn't get any ideas to settle and then I finally thought of giving a mosaic raw edge applique a try. I figured if it looked like crap, all that was wasted was a little bit of background fabric, scraps, and some of my time. Thank goodness it didn't! Whew! I am in love with it and so is big relish!! I asked her if I could put it in my room and she said "no" and that "maybe I could make another one" ---Hah! I just might!! Here are a few details on how I made this super simple and fast quilt: First, I took 1 1/2 yards of background fabric and folded it in half. I then drew half of the butterfly free hand using a disappearing fabric marker. I then place the folded backing on a big window so that I could duplicate the other half of the butterfly on the other side. Next, glue basted (using the purple washable glue stick) 1-1 1/2" scraps within the shape of the butterfly. After basing, I quilted a narrow (1/4") vertical straight stitch in order to catch as much of the scraps under the stitching, that way it doesn't fray too much. 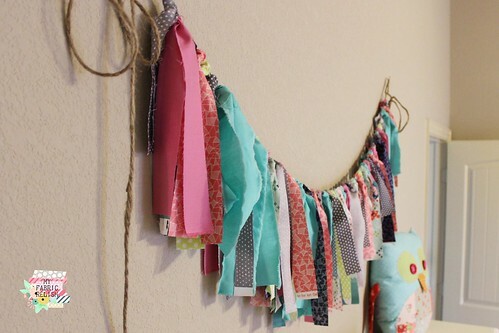 Another great use for scraps is an easy fabric ribbon banner. I used leftover fabrics from the girl's summer dresses and was able to make each of the girls their own banner for above their beds. This ribbon banner was also super fun and fast to make and really can fill up a wall! Her bed is so tall so I knew whatever I put up there needed to be long and narrow. 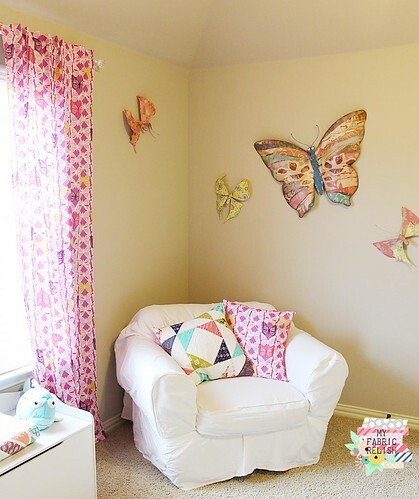 And finally here is the other corner of her room where the butterflies continue over. I used Cotton + Steel's Moonlit butterfly print for the curtains and the butterflies on the walls came from Hobby Lobby throughout the last several years. As you can see, the quilted pillows are also C+S and yes, I might be addicted! The other half of her room (book shelf and dresser) is still a work in progress and I hope to incorporate more her other favorite, horses, so stay tuned! My goal this year is to incorporate as much fabric and handmades into our new home and giving everyone's space a very personal touch that they might not have physically created but definitely had a part in the inspiration. So, if you haven't already, please go check out the Blogger's Quilt Festival and when you are there, please nominate and/or vote for me if you like (here)! Also, please let me know if you did, so I can thank you personally and return the favor if you are participating as well! Thanks so much for visiting and hope you have a great Halloween! Wow. Amazing. So much work. It's beautiful! So many cute ideas for her room. I love the butterfly, and the mosaic effect! Such a cool idea, thanks for sharing! wow, Melissa, that quilt is just perfect! Cotton + Steel's vibrant colours are just made for this pattern! I love getting a glimpse into your home, can I say I'm jealous? Everything looks so neat! LOVE this!! Your daughters room is beautiful! It's so much fun creating and decorating for the little girls! I've been having so much fun decorating my girls room! Thanks for more great inspiration! Looks great! The whole room! Well done! 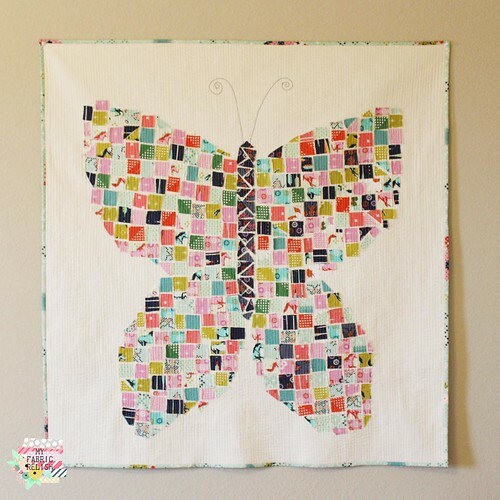 Butterflies and Owls are my shizz and i looove your applique Butterfly, good luck in the Bloggers Quilt Festival! Your quilt is just amazing! I think I want one for MY room! this has worked beautifully as if she would let you have it! Love this funky butterfly! Fun construction and quilting! Yup, definitely doesn't look like crap! :) I love it. It is gorgeous! I really love it! And it fits in her room just beautifully!